A Minke whale and her 1-year-old calf being dragged aboard Japanese whaling vessel the Nisshin Maru. 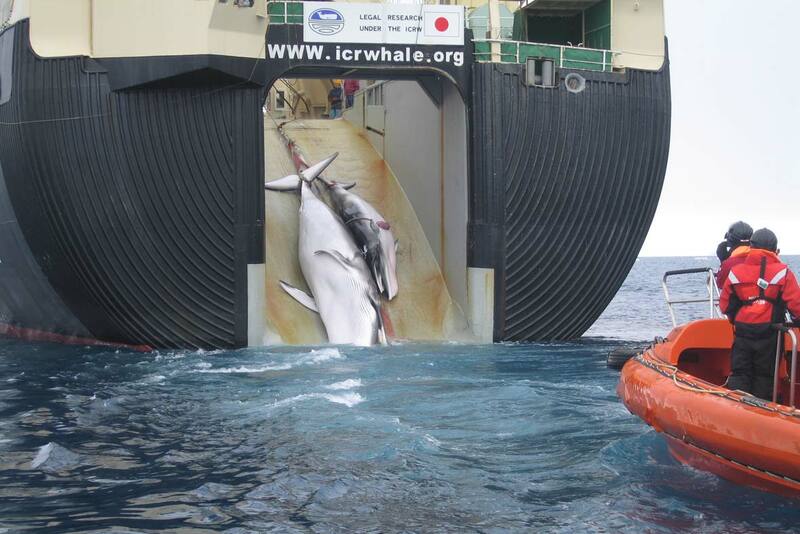 Australia's efforts to put a stop to Japanese-led whaling fleets in Antarctica have paid off. In a decision met with huge praise from conservationists and activists across the globe, the UN’s International Court of Justice (ICJ) today made a ruling against the gruesome practice. Australia took Japan to the ICJ in 2010, alleging it was intentionally taking advantage of a loophole in the 1986 commercial whaling ban by claiming it was killing the whales for scientific research. The Court ruled overwhelmingly in favour of Australia. Clare Perry, head of EIA’s Cetaceans Campaign, today said: “This is an historic decision which lays to rest, once and for all, the grim travesty of Japan’s so-called ‘scientific’ whaling and exposes it to the world as the blatant falsehood it clearly is. “For a long time it has been evident that ‘science’ has been abused at a breath-taking scale to justify Japan’s continued commercial hunting of protected whales and despite a heavily subsidised and ever-dwindling market for whale meat in Japan.